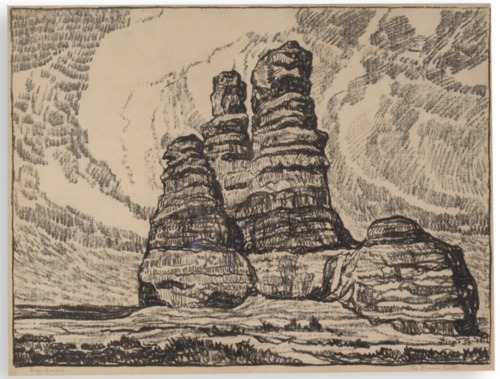 Woodblock print on white paper, depicting a towering rock formation. This print is the work of Birger Sandzen (1871-1954), a Swedish immigrant who came to Lindsborg, Kansas in 1894 to teach at Bethany College. While best known for working in oil, Sandzen also was a member of the Prairie Print Makers and successful at producing art prints.The print was done between 1916 and 1952.